Spring has just begun and for Finao Sportfishing, that means incredible Virginia fishing trips! Starting in April we will begin targetting our first species of fish. Tautog is a great tasting and hard fighting fish. These fish are in the Chesapeake Bay during the cooler weather months. Our Virginia fishing trips for Tautog leave in the morning and fish usually for half the day. Tautog feed off of mostly Blue Crabs, Fiddler Crabs, and other shell fish. Click Here to Book a Virginia Fishing trip with Finao Sportfishing! As we get into our warmer months more fish begin to migrate into the Chesapeake Bay. Beginning May 1st our Virginia fishing trips take a turn and we begin to offer Night / Evening trips for trophy size Striped Bass. Striped Bass is possibly the most popular fish Virginia has to offer! They are known for there large size, great table fair, and the different ways to catch them. In May our most common styles of fishing for Striped Bass is casting lures. Our Virginia fishing trips for Striped Bass is very hands on for our guest and that makes for never a dull moment! Approaching mid May our Virginia fishing trips begin to target Red Drum and Black Drum. Drum travel in large schools migrating into the Chesapeake bay. On Finao Sportfishing we take advantage of these large schools and fish many rods to keep the action going! The average size of Red / Black Drum is about 40 pounds but grow over 60. Drum are powerful fighting fish that take long runs and never give up! 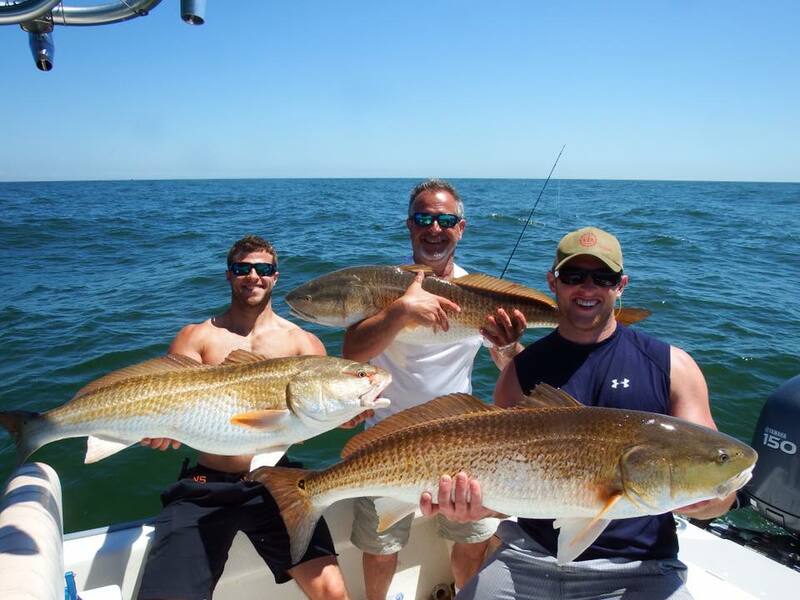 Our Virginia fishing trips target Red Drum and Black Drum till the first week of June. Be sure not to miss out on one of the most action packed fishing trips Virginia has to offer! Not only is May one of the best months to book a Virginia fishing trip it also brings in the largest fish to the Chesapeake bay. Cobia can grow to enormous sizes with some being over 100lbs! Our Virginia fishing trips target Cobia from late May through early September. These trips are day time trips leaving the dock around 9 am. When fighting a Cobia they are known for there surface fights making high jumps and fast runs! The fishing technique we use to target Cobia is sight fishing. When sight fishing there is always action from the wild life in the Chesapeake Bay. While searching for Cobia we see many other marine life such as Dolphins, Sea Turtles, and Cownose Rays just to name a few species on the surface of the water. The Chesapeake Bay is home to some of the best fishing in the world. Finao Sportfishing is located along the coast of the Virginia at Vinings Landing Marina. Be sure not to miss out on this seasons Virginia fishing trips with Finao Sportfishing. We will begin fishing this April through the rest of the year!